Team Sky has elected not to take part in the 2016 Tour of Qatar and Tour of Oman, the first time the British team has missed the Middle East races since the squad’s debut in 2010. Sky says it has nothing to do with last year’s rider protests due to extreme weather conditions. After high winds and heat swept across the Arabian Peninsula, cyclists stopped, argued and forced the local organiser and co-owner Eddy Merckx to cancel the fifth stage on February 21. Merckx said the next day that the locals were “very angry with a few riders and some teams may not be invited back”. “It had nothing to do with that,” Sky sports director, Servais Knaven told Cycling Weekly. The 2016 Tour of Qatar is scheduled for February 8 to 12, and the Tour of Oman, February 17 to 22. Both events are managed by ASO, which also organises the Tour de France and many other events. Knaven said that he does not know if the organiser sent Sky an invitation prior to the team making its decision. Team Trek Factory Racing, which had star Fabian Cancellara leading the protests, received an invitation but replied and said it would not attend. Along with Sky, several top teams were left off the publicised list of participating teams released last week for Qatar and Oman: Trek, Tinkoff, Movistar and Orica. Etixx-QuickStep agreed to race only in Oman. Sky, however, is more concerned with its riders’ schedules leading up to the classics than any bitter taste that might have remained after the heated day 10 months ago. 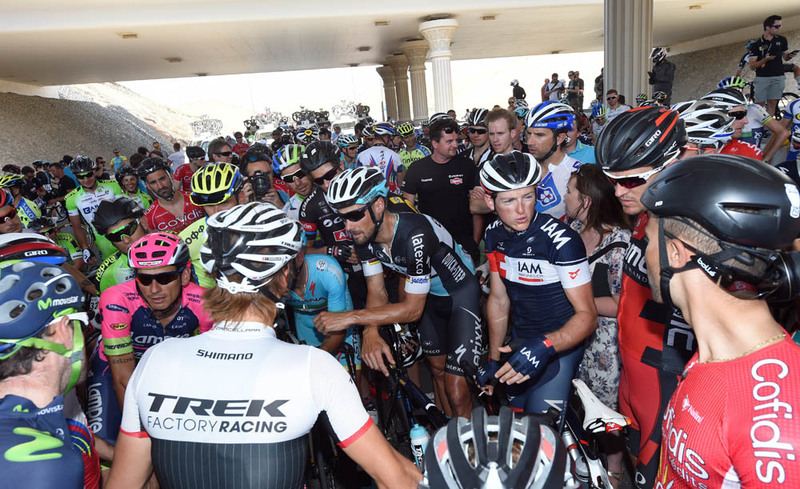 The organiser requires cyclists to stay on after the five-day Qatari race for the Tour of Oman five days later. If teams want to switch out their riders, they must pay the airfare themselves to do so. In the past few years, Sky flew in Chris Froome, who won the race in 2012 and 2013. Knaven added that it is “probably a coincidence” that Etixx, Trek and others pulled the plug on Tour of Qatar at the same time. The race with its flat desert roads, high speeds and cross-winds is ideal training for the classics from Het Nieuwsblad to Paris-Roubaix. Instead, leaders Luke Rowe and Ian Stannard must look to Australia, Dubai and races throughout Europe to build up to the spring’s big one-day races. “Qatar has always been a good race to prepare for the classics, that’s 100 per cent sure, but we don’t have eight guys who are specialists in the cross-winds, and then the guys who are the specialists are up for doing something different [in Oman],” Knaven said. Part of Sky’s classics group will race a block in Australia with the Tour Down Under, Cadel Evans’s Great Ocean Road Race and the Sun Tour. Others will skip the Sun Tour and come back to Europe for Portugal’s Volta ao Algarve where Geraint Thomas won in 2015. Some will stay closer to home to race in the Mallorca Challenge, the Dubai Tour and Algarve.